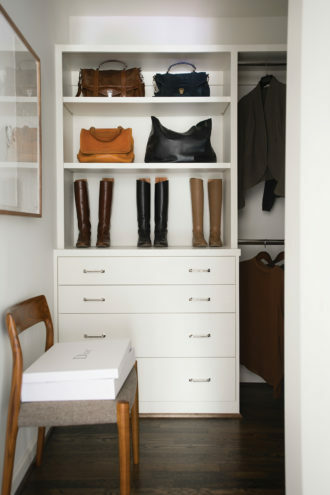 Five experts tell you what to buy and how to shop so that you can minimize clutter and buy for longevity. Read on for their secrets. Jamie Lyons and her husband, Brocke, sit in the living room. 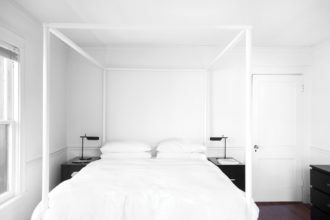 The self-described minimalists stick to a monochromatic color scheme throughout their Oak Cliff home. 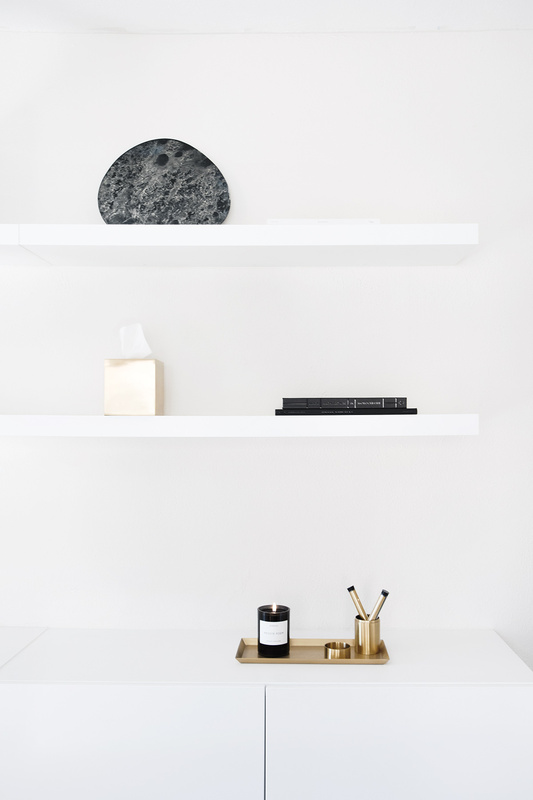 Stylist Jamie Lyons and her husband, Brocke, live by a minimalist code in their Oak Cliff home. Upon first walking into Jamie and Brocke Lyons’ Oak Cliff home, it’s evident the creative couple—she a freelance stylist, he a digital tech for Neiman Marcus—live by the minimalist mantra “quality over quantity.” The front living space filled with select pieces is void of color, only Farrow & Ball’s Slipper Satin on the wall and trim. As you make your way in, side tables and office bookshelves show no signs of chaos, every accessory and paper in its place. Surely office drawers or medicine cabinets are grounds for “stuff.” No. Not here. They only prove the couple’s allegiance to the lifestyle, soaps wrapped in modern packaging, white towels folded crisply, and two hairbrushes placed on a black tray. 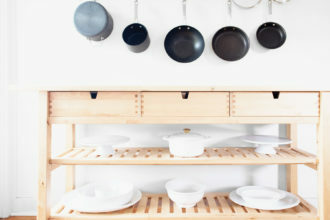 Before Jamie Lyons buys a new item for her home, she asks herself a few helpful questions. once you start the practice, you’ll find how much easier it is to thoughtfully collect. 1. Is there anything about this I would change? Jamie makes sure that when she’s looking to fill a spot in her home or wardrobe, she finds the exact piece she’s looking for. “I think it’s worth doing a little extra searching,” she says. 3. Is this replacing something I currently own? If the answer is yes, make sure to sell, donate, or rehome the item in question before you make the purchase. She likes to donate to Genesis Women’s Shelter. 4. Is it me? “This is a tough one, because it’s easy to get caught up in the beauty of well-designed things,” she says. This is an important question if your goal is to curate an aesthetic. Jamie and Brocke’s home has not a paper out of place. Here she lists items she loves to keep her life organized and beautiful. 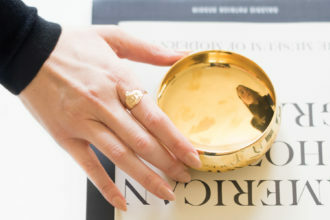 Tenfold New York marble bowl: “We currently use it as a place to drop our keys when we walk in the door, but it would also be beautiful filled with fruit,” she says. 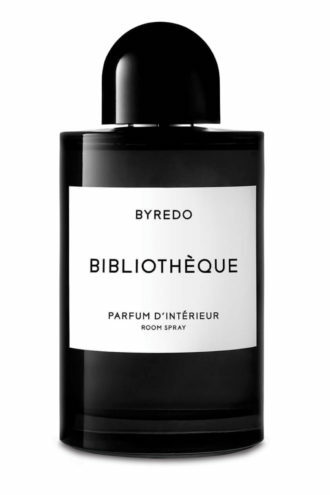 Byredo candle: Jamie and Brocke have these candles burning throughout their home in the bathroom, master, and hallways. “They smell amazing, and I love how they look in our space,” she says. Tenfold New York tissue cover: “This transforms an item as mundane and pragmatic as Kleenex into something I’m excited to put on my shelf,” she says. Tenfold New York containers: “I love these for storing necessary items like bobby pins and cotton swabs,” she says. 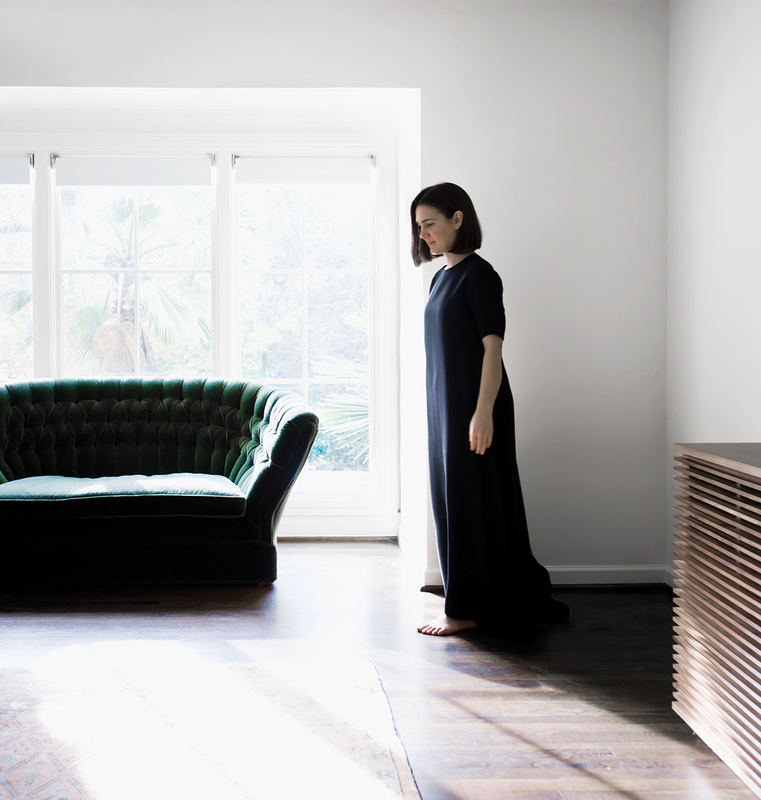 Fashionable minimalist Jenny Walker has refined her clean-lined style into a science. In a world where the best-dressed list sport the latest trends and “It” accessories, Jenny Walker stands alone. 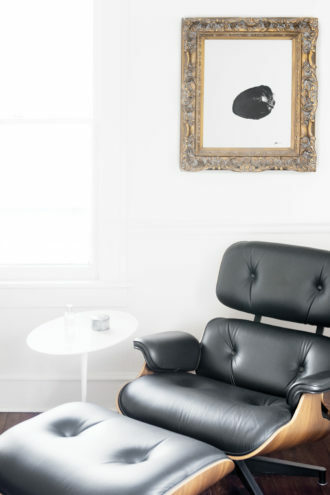 The Dallas-based designer of a line of chic, gender-neutral baby furniture, Jenny carries her pared-down and print-free aesthetic over to her wardrobe. 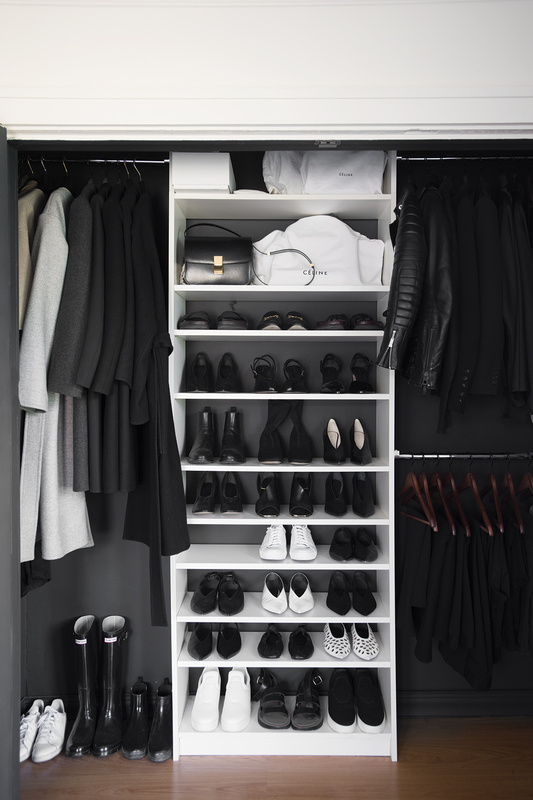 Filled with the likes of Givenchy, Céline, Lanvin, and The Row in shades of black, cream, blush, and tan, her favorite clothes hang with an aesthete’s eye for detail. Jenny comes by her Spartan ways genetically—both her father and mother also avoid clutter. But it wasn’t until her grandmother took her back-to-school shopping with her sister and cousins that she honed her style with an emphasis on purchasing high-quality pieces. Post-college, she wore a lot of Theory until she landed a job as the assistant to Kenny Goss of the Goss-Michael Foundation. The gig came with a clothing allowance, and Jenny was smart enough to wait until Partner’s Card—The Family Place’s annual discounted shopping event and fundraiser—rolled around to snag key items such as Rick Owens leather jackets on deep discount at Forty Five Ten. After marrying professional racecar driver Russell Walker and giving birth to her now 3-year-old daughter, Ada, she purged even more. Even though the family moved to an expansive new home near Turtle Creek, there are no tchotchkes on the side tables and no extraneous accessories on their owner. Jenny only likes to wear her wedding rings and a single pair of earrings from Grange Hall. Jenny Walker is no impulse shopper: She asks herself five easy questions before she adds any item to her wardrobe. 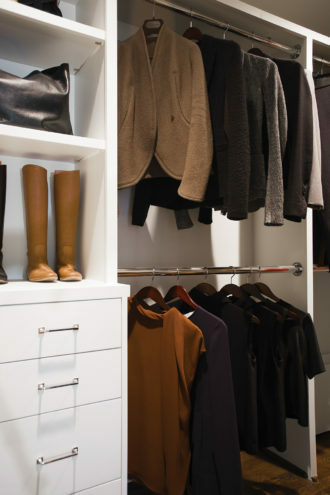 When it’s time to clean her closet, she resells items on The Real Real or donates them to The Family Place. Will it flatter me? Choose elongating silhouettes. Jenny recommends a full-length flared or straight-leg pant with heels or a cropped pant with flats. Skirts that hit below the knee with a slight flare at the hem look good on women of every size. Is it well made? What’s on the inside is as important as the outside. Turn items inside out to check for hanging threads and crooked seams. Looking at things from all angles will let you know a design is worth the money and likely to hold up through multiple wearings. Does it have multiple uses? Make sure you can dress things up or down. Because she tends to purchase pieces by high-end designers, Jenny considers what they could look good over, under, or paired with in her wardrobe. 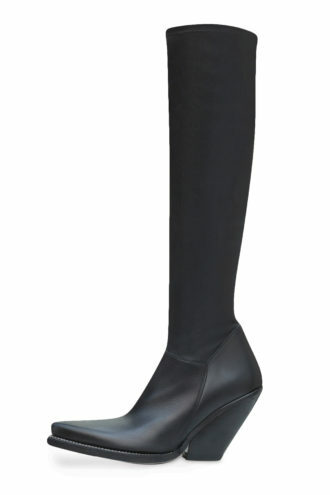 Dresses must be able to be worn with riding boots and a blazer during the day and work with heels for night. Does the designer cut for my body? Once you discover the designers that look best on you, you can mix and match items into your wardrobe more easily. And, if you really love a piece, purchase it in multiples so that it will wear slowly and last longer. If your goal is a simple, chic capsule wardrobe, Jenny recommends the following five items to go the distance. 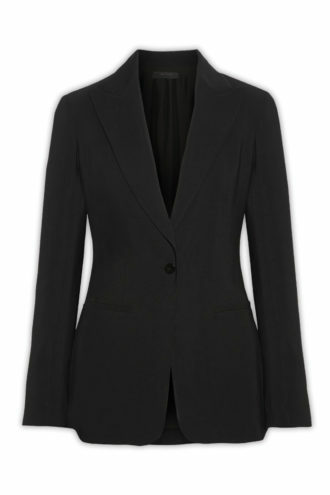 A single-breasted blazer in black or navy: Jenny prefers The Row’s style with quarter-length sleeves. A basic V-neck or crewneck tee in gray or white: The Great’s sturdy versions available at V.O.D. have stood the test of time in Jenny’s closet. A sleek, black pant: The Row’s cigarette style holds its shape through multiple wears. A below-the-knee camel skirt: High-waisted and slightly flared, Jenny loves Jil Sander’s version. A riding boot and a strappy sandal: Brown boots by Céline and Chloe’s strappy heel can be worn with everything from dresses to jeans. 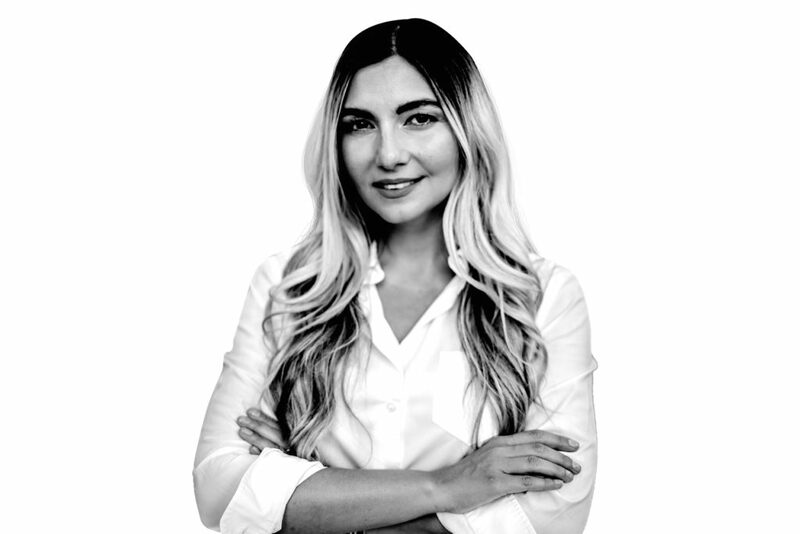 Nasiba Adilova, owner of stylish kids store The Tot, tells you how to pair down and buy nontoxic items that will benefit your children’s development. It’s time to take back control of your overcluttered playroom. Play kitchen: “Beyond its cuteness factor, imaginative play has a range of cognitive and emotional benefits,” she says. 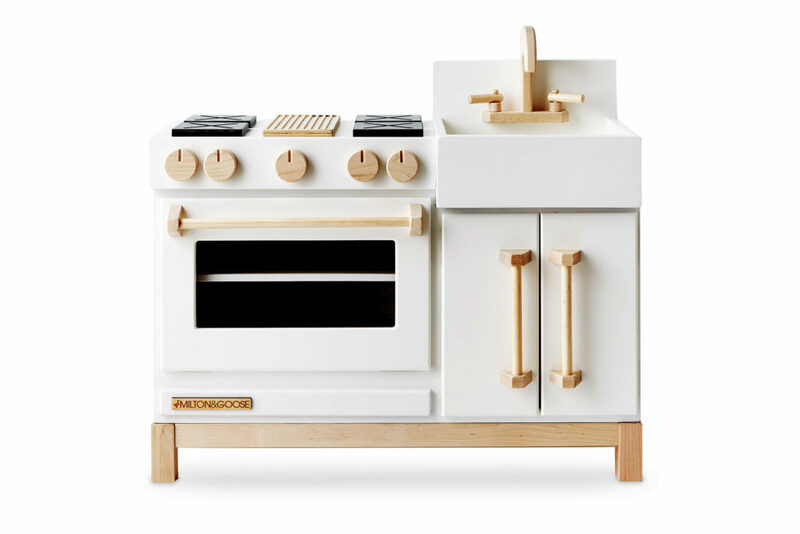 She encourages including a kitchen in your playroom—your child’s imagination will run free. Art supplies: “I recommend safe and completely nontoxic paints made with vegetable and mineral pigments and play doughs colored with things like beets or spinach,” she says. Pick up a variety at The Tot. Books, books, books: “Kids can never have enough books,” Nasiba says. She loves The Tiny Bee Gift Co. For each Tiny Bee book purchased from The Tot, Tiny Bee donates a second book to Baby2Baby. Ride-on toys: “They’re a fantastic way to encourage imaginative play,” she says. Choose from simple scooters, vintage collectible pedal cars, and modern minimalistic designs. What is it made of? Find out if it is free of harmful chemicals. What is my child interested in right now? 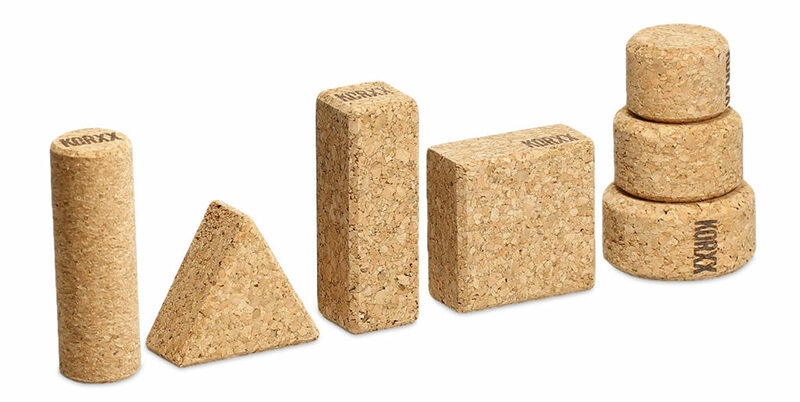 “Young toddlers developing their motor skills may want blocks to build or equipment to climb on,” Nasiba says. Does my child really need this? “If so, then we like to donate toys or books before receiving anything new,” she says. Is it durable and will it last? Nasiba says to think about whether it can be passed down to siblings or on to friends. Where to donate: “It’s healthy and natural to let go of toys that are no longer serving your children,” Nasiba says. “Also, it’s a learning opportunity for children to be charitable from a young age.” Several Dallas-area charities accept gently used toys, often those with resale shops. Consider Genesis Women’s Shelter or The Family Place. How many lipsticks do you own? 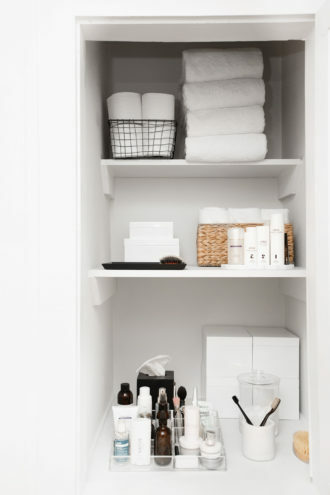 Do you really use every face cream in your makeup drawer? 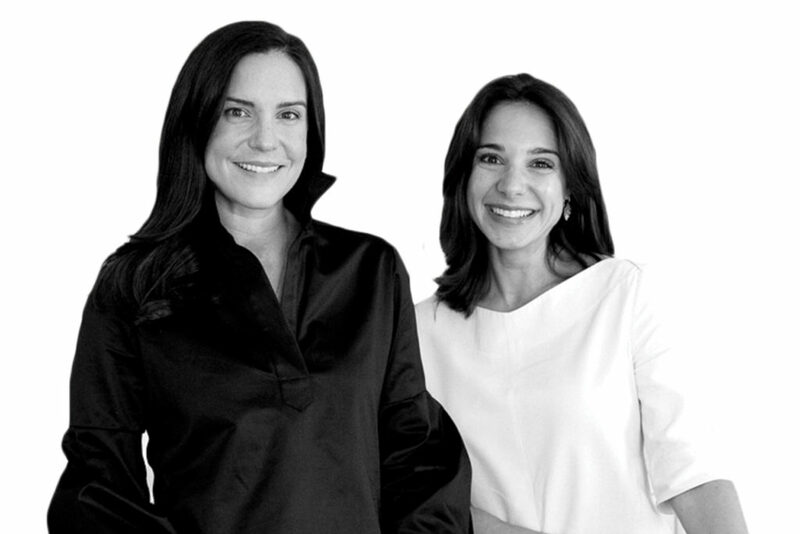 Flauren Bender and Hallie Lamont, co-owners of natural beauty store The Greenway Shop, share the only items you need to glow from the inside out. Serum: “Serums used to treat issues from hyperpigmentation to fine lines and wrinkles are the workhorse of your skincare routine,” Flauren says. 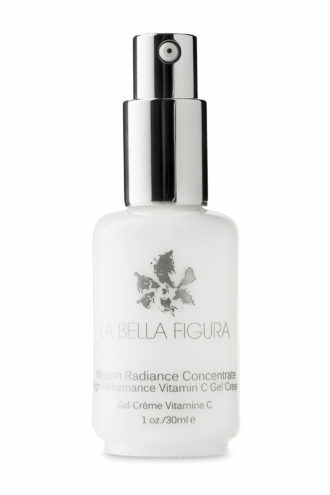 Their favorite is La Bella Figura’s Modern Radiance Concentrate, which is a super-effective vitamin C serum. Sun protection: Hallie and Flauren recommend mineral-based formulas that use zinc or titanium dioxide to physically block UVA and UVB rays. 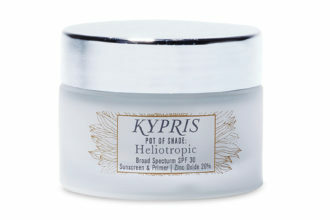 Check out Kypris’ Pot of Shade, a translucent, broad-spectrum, non-nano SPF 30 that goes on easily. Deodorant: While clean deodorants aren’t one size fits all, it’s important to find one that works with your body chemistry. Flauren and Hallie love and use Ursa Major’s Hoppin’ Fresh. Lipstick: “Kosås lipsticks are beautiful and super moisturizing, free of preservatives and synthetic fragrances,” Flauren explains. Does it work? ”The primary reason to buy or continue using a product is because it works for your skin and it delivers results,” says Flauren. Will it be easy to work into my current routine? 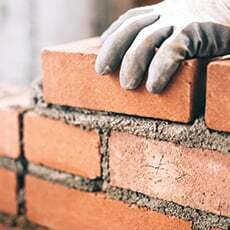 “We advise our customers to only buy products they’ll use and can incorporate into their daily routines,” Flauren says. For example, if your routine is a cleanser followed by SPF, adding a toner and serum might be one too many steps. Will I enjoy using it? “Everyone is busy and spread thin,” Flauren says. “Your skincare routine can be a few mindful minutes to step back from the daily hustle and take care of yourself.” If you don’t enjoy using a product, toss it. Or if you haven’t opened it, donate it. Does it smell good? If a product reminds you of a happy childhood memory or the aroma is fresh and clean, it can enhance your experience. “Your routine should make you feel your best, and scent plays into this,” she says. Where to donate: Unused, unopened cosmetics and toiletries can be donated to Jewish Family Service or The Salvation Army. The kitchen can be a breeding ground for unused appliances—drawers full of strainers, peelers, and zesters that rarely get used. 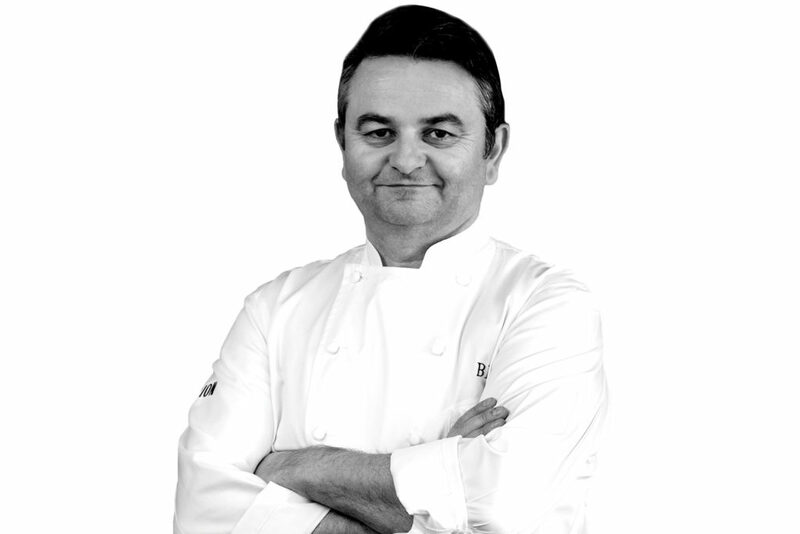 Chef Bruno Davaillon, whose resume includes the Rosewood Mansion on Turtle Creek and his new French restaurant Bullion, points out the key items you need to be a top chef. Stackable clear plastic containers with sealed tops: “You can use them for everything—your spices, flour, sugar, rice, and grains,” he says. You can find them in bulk at the grocery store. “I also recommend a labeling machine, and label the containers for each product. It will look great in your pantry,” he says. Do I need another type of oil? 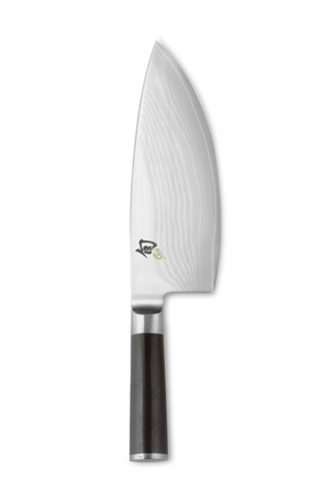 “Use canola oil or vegetable oil to cook and a good extra-virgin olive oil for salad,” he says. Do I already have something similar? “We like the new look of an item, but we already have one that works perfectly,” he says. Will this item last? 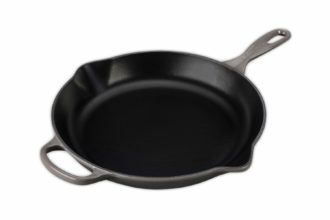 Be aware that when you buy nonstick products, they deteriorate faster. Do I need another mixing bowl? You need just three sizes—small, medium, and large. Why do I have so many condiments? “Start clearing those that have been open for months,” he says. Where to donate: Clean out your pantry and donate unused canned food items to the North Texas Food Bank. Their most needed items include peanut butter, healthy cereal, whole-grain rice or pasta, canned tuna or chicken, dried or canned beans, and canned fruits and vegetables.